Ready for a fun week at summer camp? Make sure you and your kids are safe by starting your week with one of these important camp rules videos from The Skit Guys! Ahh, church camp! Amazing worship, inspiring sermons, mediocre food and team building games. Oh who are we kidding? It’s all about finding that “special someone” who you’ll never see or speak to again after you get back on the bus to go home. But just in case you were wondering if it’s okay to express that eternal and undying love, here are The Skit Guys to lay down the ground rules. If you follow this one rule…just one little rule…everyone will have a great camp experience. 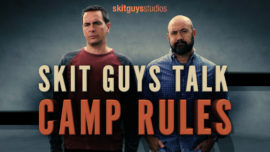 Let the Skit Guys lay down this rule with your group: great for camps, retreats, lock-ins, pretty much any time you want to have a great time with your group.